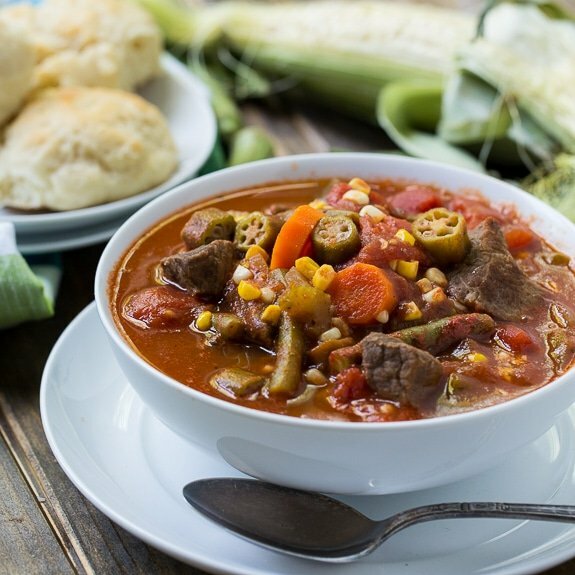 Old-fashioned southern Vegetable Beef Soup is like a bowl full of comfort. So much flavor! As we approach the last days of summer, Vegetable Beef Soup is the perfect way to use up the last remnants of the summer garden. 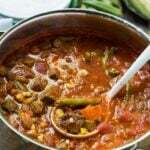 Pretty much any vegetable can be used in vegetable beef soup- zucchini, squash, lima beans, spinach – whatever you have on hand and you’d like to get rid of. Throw it all in the pot. 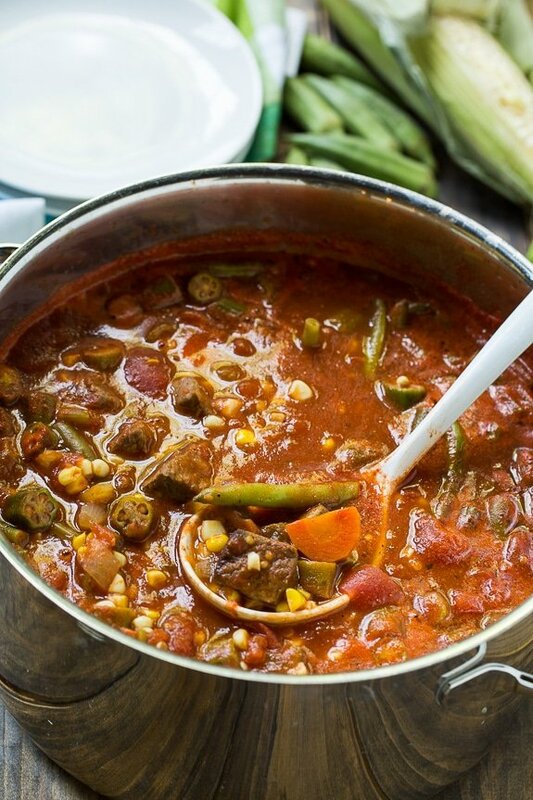 My favorite vegetables to put in this soup are corn and okra. If you don’t have fresh, frozen can be used. 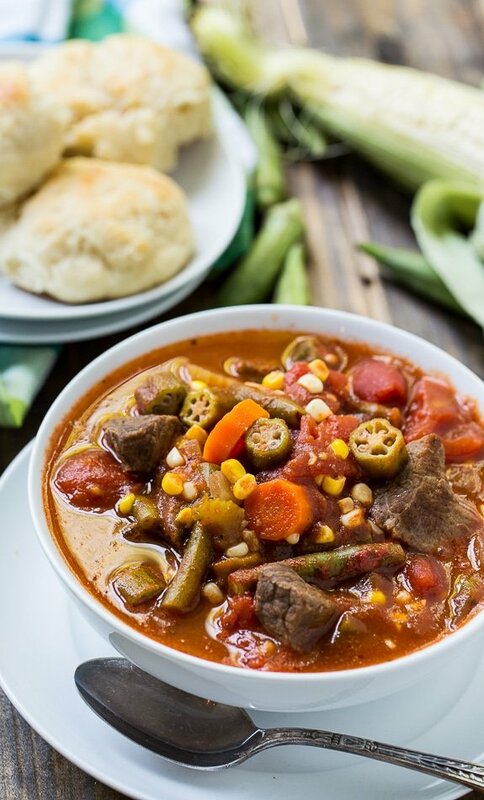 In fact, Vegetable Beef Soup is perfect for using up those last little bits of vegetables in your freezer. I like chunks of sirloin steak in my Vegetable Beef Soup, but you can easily substitute ground beef. This soup freezes really well so put some away in the freezer. A month from now when school is in full swing and you’re crunched for time, you’ll be glad you did. Add a quick grilled cheese sandwich and you have Southern comfort food at its best. If you want you soup spicy, just add a couple shakes of Tabasco Sauce sauce or a few pinches of red pepper flakes. 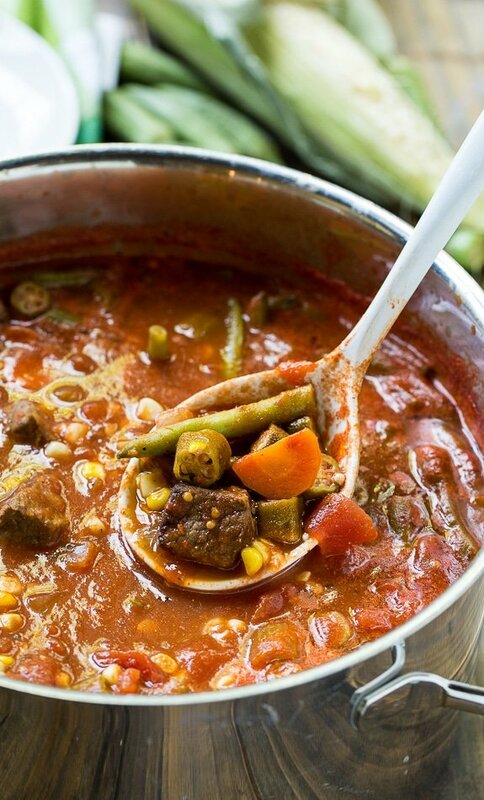 Vegetable Beef Soup is the perfect way to use up the last remnants of the summer garden. Full of tender chunks of beef and lots of veggies. Heat oil in a Dutch oven. Season beef with salt and pepper and cook in oil until browned on all sides. Add all tomatoes and tomato juice, chicken broth, onion, celery, sugar. salt, pepper, Worcestershire sauce, Italian seasoning, garlic powder and bay leaf. Bring to a boil and reduce to a low simmer for 1 hour. Add remaining ingredients and simmer for 1 more hour. 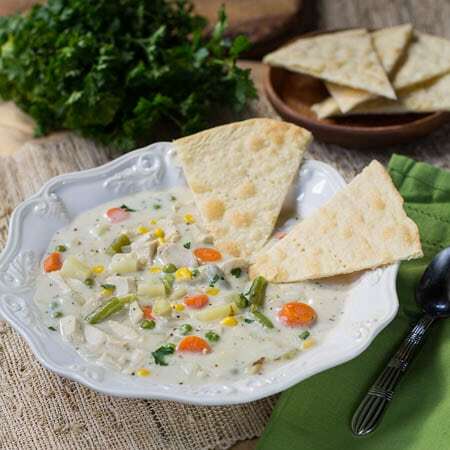 This entry was posted in Soups and Stews and tagged beef, Soup. Bookmark the permalink. Does it call for 2 28 oz can of whole tomatoes? Reminds me of my grandmother’s vegetable soup! A bowl of this soup would be delicious right now! I am looking forward to cooking it soon. Hope you enjoy it Joanne! I am such a soup lover. I can eat it all summer long! This is so perfect for the cooler temps that are coming so quickly! You’re making me SO excited for all things warm and cozy to dig into for fall! 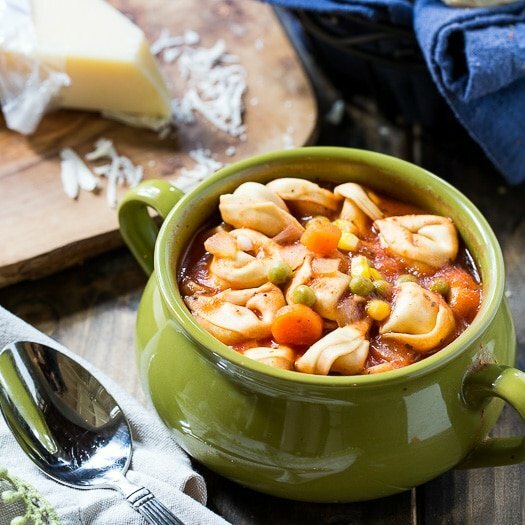 This soup looks so hearty and perfect for weeknights when you’ve just gotta have something comforting! Warming, spicy, yummy! Looks such a comfort food! I love all the veggies in this soup! Such a great way to use up what’s left from your garden. It looks so comforting and delicious! 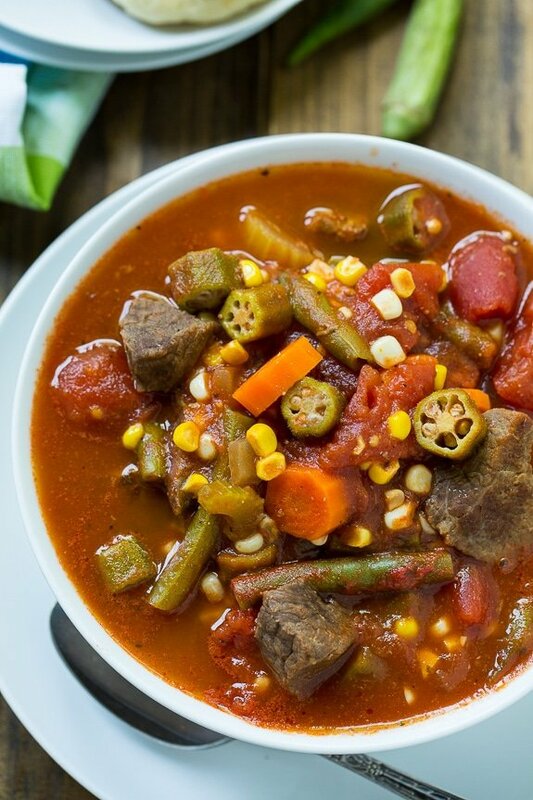 You can never go wrong with a big bowl of Vegetable Beef Soup. It’s definitely a comfort food no matter what type of the year it is. This soup is right up my alley, Christin! I love how flavorful and full of comforting ingredients this is. Sounds just perfect!